Apple updated the new 21.5-inch iMac with Intel Ivy Bridge processors, a RAM boost, and new Nvidia GeForce graphics processors. But the two most significant changes to the new iMac are its thinner design—which introduces compromises you’ll need to make—and the option to upgrade to Apple’s Fusion Drive technology. Using a process called friction stir-welding, Apple designers figured out a way to connect the front and back of the iMac’s aluminum case while reducing the width to just 5 mm at the edges. Apple also reduced the weight by more than 7 pounds. The new iMacs are positively striking when viewed from the side, and many curious co-workers came by Macworld Lab to admire the new iMac’s svelte profile and run their fingers down the super-thin edge. When viewed from the front, however, it’s difficult to see that reduced thickness. One noticeable difference is the reduction of glare from the display, which Apple says has been reduced by 75 percent. Looking at the display of a powered-down 2011 iMac is like looking at a mirror, but on the new iMac, the reflection is much less pronounced. I used a flashlight and looked at the reflection on the wall behind me and the reflected light was much, much brighter from the 2011 iMac than on the new iMac. This is a result of Apple’s new anti-glare coating technology that lowers reflection without darkening the screen or affecting color. Apple eliminated the 2 mm air gap that used to exist between the iMac’s glass cover and the LCD panel. Now, the glass is directly adhered to the panel, which helps to further reduce glare and reflection, but also makes replacing the front glass more expensive. If the glass breaks, you now have to replace the whole display. Colors still look vibrant and photographic images pop, with dark blacks adding the appearance of depth. The iMac’s LED backlit IPS display, with a native resolution of 1920 by 1080 pixels, has a wide viewing angle that lets you and several others collaborate around the iMac screen with very little loss of contrast or color shifts as you move from the center of the screen. Apple made major tradeoffs in order to dramatically thin down the new iMacs. The iMac joins the MacBook Air, Mac mini, and Retina MacBook Pro as computers that no longer have internal optical drives. If you need to use and burn CDs and DVDs, you need to attach an external optical drive, like Apple’s $79 USB SuperDrive, an 8X DVD burner that runs on USB bus power. Left to right: Audio out, SDXC card slot, four USB 4 ports, two Thunderbolt ports, gigabit ethernet. User-accessible RAM slots are also gone on the 21.5-inch iMac. The standard-configuration iMac comes with 8GB of 1600MHz DDR3 memory, which should be plenty for most people. Last year’s model had 4GB of slower 1333MHz DDR3 RAM. If you think that you may want more memory down the road, you should customized your order so that 16GB of memory is installed at the factory—a $200 option. Adding RAM after your purchase will most likely require a visit to an authorized Mac repair shop. Getting into the old iMac was no easy task; you needed suction cups to help pull off the glass, which was held on by magnets. The new iMac is even more difficult; the glass is attached using an adhesive strip that must be cut to open the iMac, and that strip needs to be replaced in order to close the iMac. The new iMac moves the handy SDXC card slot from the left edge to the rear, next to the USB and Thunderbolt ports. FireWire 800 ports are no longer available, and you’ll have to use an adapter like Apple’s $29 Thunderbolt to FireWire 800 adapter to connect FireWire devices. The new iMac has the same number of USB ports as the 2011 model, but the four available ports are now of the speedy USB 3 variety, instead of pokey USB 2.0. The USB 3 ports are backwards compatible with USB 2.0, should you have such peripherals. The new iMac still has a gigabit ethernet port and a headphone/audio-out port on the back, but an audio-in port is no longer provided. The new iMac gets a second Thunderbolt port, which is very convenient if you want to connect multiple Thunderbolt devices. The new iMac also sports redesigned speakers. Setting the new and old iMacs side by side, the music playing through the new iMac sounded noticeably warmer and fuller than the previous iMac. The older model sounded a bit louder, but shrill in comparison. All results are scores. Higher scores/longer bars are better. Reference models in blue. Macworld Lab testing by James Galbraith, Albert Filice, and Kean Bartelman. The new iMac comes with Intel’s Ivy Bridge quad-core processors that share 6MB of L3 cache. 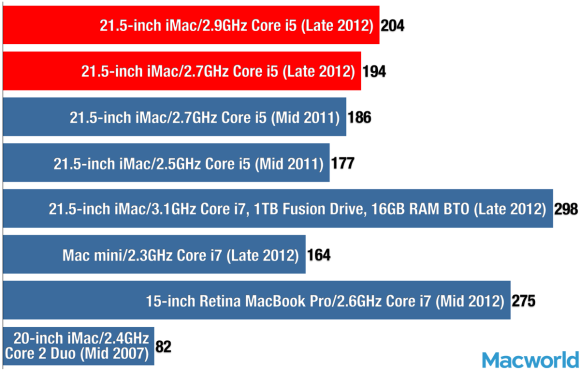 The $1499 iMac has a 2.9GHz Core i5 processor, while the $1299 iMac has a 2.7GHz Core i5 processor. The processors support Intel’s Turbo Boost, which allows a processor to run faster (up to 3.6GHz on the $1499 iMac and 3.2GHz in the $1299 iMac) with processor-hungry applications. The optional 3.1GHz Core i7 quad-core processor, a $200 upgrade to the $1499 model, offers Intel’s Hyper Threading. This technology allows applications to address twice as many virtual processing cores, helpful in applications that can take advantage of multiple cores like Mathematica and Cinema4D. The new high-end 21.5-inch 2.9GHz iMac was 12 percent faster than the previous high-end 21.5-inch iMac with a Sandy Bridge 2.7GHz Core i5 quad-core processor in our MathematicaMark tests and 17 percent faster in the Cinebench CPU test. The new entry-level 21.5-inch 2.7GHz iMac was 11 percent faster than the previous entry level 21.5-inch iMac with a Sandy Bridge 2.5GHz in both MathematicaMark and Cinebench CPU tests. Apple also updated the graphics processors in the new iMacs. The ATI Radeon has been replaced by Nvidia graphics processors: the GeForce GT640M in the $1299 model, and the GeForce GT650M in the $1499 model. Our Portal 2 test results were 7 to 8 frames per second faster on the new iMacs when compared to the previous models, but the Cinebench OpenGL test results were 10 and 12 percent slower than the previous low and high-end iMacs, respectively. Because of the reduced case size, Apple uses smaller 2.5-inch 5400-rpm hard drives in the new 21.5-inch iMacs, where Apple previously used 3.5-inch 7200-rpm drives. (The 27-inch iMacs still use 3.5-inch 7200-rpm hard drives.) Apple increased the cache size on these slower-spinning drives to help increase the performance. But even with the larger cache, the older iMac’s 7200-rpm drives finished our file copy test faster than the new iMac’s 5400-rpm drives. The file unzip test was just 1 percent faster on the 2011 iMac. If you want faster drive speed, as well as zippier startup and application launches, the new $1499 21.5-inch iMac can be outfitted with Apple’s 1TB Fusion Drive. Fusion Drive combines fast flash storage with high capacity hard drives and presents the two as one drive to the user and software. The OS and all applications that come with an iMac are loaded onto the flash portion of the Fusion Drive, making application launches and restarts much faster than with a standard hard drive. In our testing, we found that most tasks on a Fusion Drive perform at the same speeds as a stand alone solid-state drive, even with 600GB of data loaded onto the drive. Long extended writes and reads will eventually hit the bottleneck created by slower hard drive speeds, as you’d expect. Previous testing showed Fusion Drives able to finish our 6GB file copy tests in about 40 seconds, while the 5400 rpm hard drive in the iMac took around 150 seconds to complete. Fusion Drive is not available on the $1299 model. The new iMac steps into the future, with cutting-edge design (literally), updated processor and RAM, better sounding speakers, and reduced-glare (but still glossy!) screens. Unfortunately, the new iMac also follows Apple’s trend towards less repairable and upgradeable Macs and the elimination of useful features such as optical drives and FireWire 800 ports. I think it’s reasonable to drop the optical drive from laptops, where the benefit of reduced size and weight can be immediately appreciated when you walk around with a laptop in your bag. On a desktop computer like the iMac, it’s unclear what the benefits are of going without these conveniences in order to have a thinner and lighter iMac at your desk—unless you’re admiring the iMac from the side, of course. The $1499 iMac benefits from a Fusion Drive upgrade to Fusion Drive and Core i7 processors—something you can’t do with the $1299 iMac. iTunes and Cinebench CPU results are in seconds, (lower results are better). VMware PCMark and MathematicaMark 8 are scores (higher results are better). Best result in bold. Reference models in italics. Results are in frames per second. Higher results are better. Best result in bold. Reference models in italics.